There are three bedrooms in the main house of the villa. They are all air-conditioned and have ensuite bathrooms and a double bed. The guest cottage which is adjacent to the villa can also sleep two people with a small double bed and bathroom. 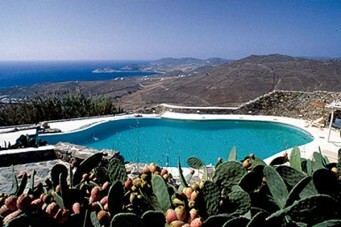 Private villa Singing Ravine is located on the island of Mykonos in the Cyclades group of islands in Greece. All major airlines fly to Athens, and from here Mykonos is a short ferry ride away. The Singing Ravine overlooks Lia Bay on Mykonos, and has gorgeous panoramic views of the ocean and valleys of the island. The villa itself has crimson-roofed chapels, and is etched with vibrant colors which blend in with the colorful garden of flowers which surrounds it. She is a tranquil haven that offers the ultimate in luxury for your holiday. Inside the villa, each bedroom has its own theme and color. A main feature of the villa is the main ensuite bathroom which has a domed ceiling of miniature skylights, where light rays come through to light up the room. The bathroom also has a double marble basin vanity. The lounge room has very elegant and simple décor, and is adjacent to the state of the art kitchen. There is also a large terrace of course with magnificent views over the sea, and lounge chairs and a dining area. There is seating available for eight people. Next to the terrace is a large pool for you to relax by and cool off in! And there is even a relaxation room next to the pool which has an air-conditioned gym, a large Spa Pool and a steam bath shower. Adjacent to the villa there is also a traditional Mykonian guest house which is surrounded by beautiful gardens and reached by crossing a wooden bridge. In high season there is a minimum booking period of 2 weeks (June, July and August). The Singing Ravine is located 2km from Lia Beach, and 15km to the closes town and shops. She provides the perfect place to escape from the crowds and truly get away from it all! At the Singing Ravine, there is air-conditioning in the main house. There is also a fantastic outdoor dining area with a BBQ for entertaining. There is a small gym with fitness equipment and a steam room. High speed internet is available along with satellite TV, stereo system and telephones.